Why you should give away a lot of free stuff | Andy Sernovitz | Damn, I Wish I'd Thought of That! Because you never know when someone is going to show it to a friend. Give away samples, handouts, shirts, stickers, toys–everything. Most will never be seen again, but every so often you get a big score. 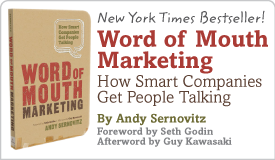 I sent 300 copies of my word of mouth marketing book to the BazaarVoice Customer Summit. One of them showed up on Ze Frank’s show on Time.com.